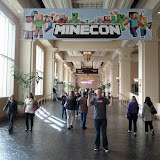 Last week I had a chance to attend and present at MineCon 2011. It was a fantastic event. The huge number of participants (easily over 4k) as well as the great vibe totally blew my mind. Below is the slide deck from my presentation entitled “YouTube API for Game Developers” with Cliff Samaniego and after that I will share some general impressions from the show. 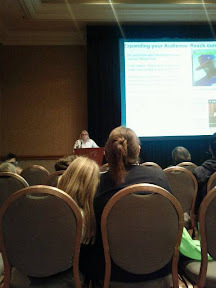 The conference took place at the luxurious Mandalay Bay Resort in Las Vegas, NV and all the amenities were first class. Even the WiFi network mostly worked, which is a big achievement for an event of this size. The crowd was very diverse, frequently one could spot two or three generations of Minecraft fans attending. It was definitely designed to be a family affair, and the format really worked perfectly. What impressed me the most is the quality of questions directed at various panels by very young Minecraft players. If this is representative of what the next generation will be like, we have nothing to worry about. My favorite part was the keynote as well as the developers’ panel I watched on second day of the conference. Lydia Winters did a fantastic job running the keynote. The Mojang team history and intro shown in the video below as well as the official launch (second video) were quite memorable. I took a stroll on the exhibition floor and below is what it looked like. The lines to buy Minecraft memorabilia were onerous throughout the show, but that did not seem to deter fans from trying. I also took a few photos at the conference, you can find them in the album below. Since I had to get back to San Francisco on Saturday, I did not have much time to explore Las Vegas on this trip. I did, however, manage to capture the famous fountain water show at the Bellagio with my Nexus S during a late night stroll, so here it is for your viewing pleasure. 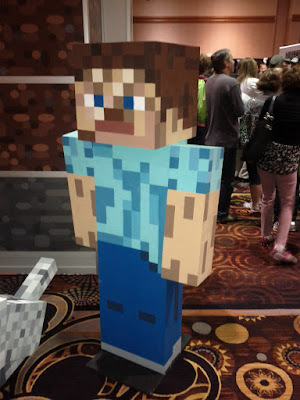 This entry was posted in gaming, minecraft and tagged minecon, vegas on November 24, 2011 by jarek.